Can Tho felt a lot like Ninh Binh: underdeveloped, local, authentic. The few hotels in the riverfront were quite expensive, and we walked a bit deeper into the back streets to find a decent budget place. We had left most of our luggage in HCMC, but still had small backpacks we wanted to unload. By then, we were starving, so we sat down at a quaint restaurant on one of the main streets, Hai Ba Trung. The food was yummy, especially some caramelized fish, giving us a first taste of what we would experience in Can Tho, definitely our favorite place to eat in all of Vietnam. We strolled around the riverside, with its nice park, the pier full of shops, and some pedestrian streets. There wasn’t much going on in the city at that time, it would become much livelier in the evening. There was one thing that was already up and running: fruit stalls. 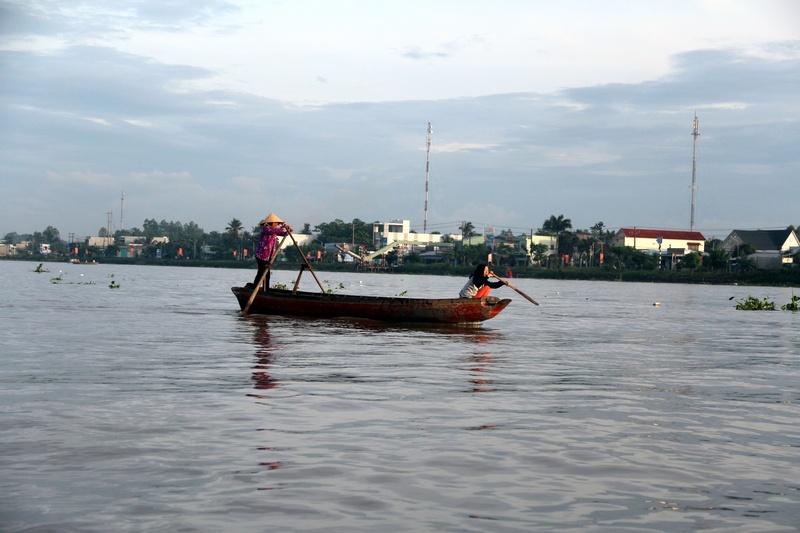 The Mekong Delta is considered the rice bowl and the orchard of Vietnam, its unique geography and climate making it the perfect place for agriculture. 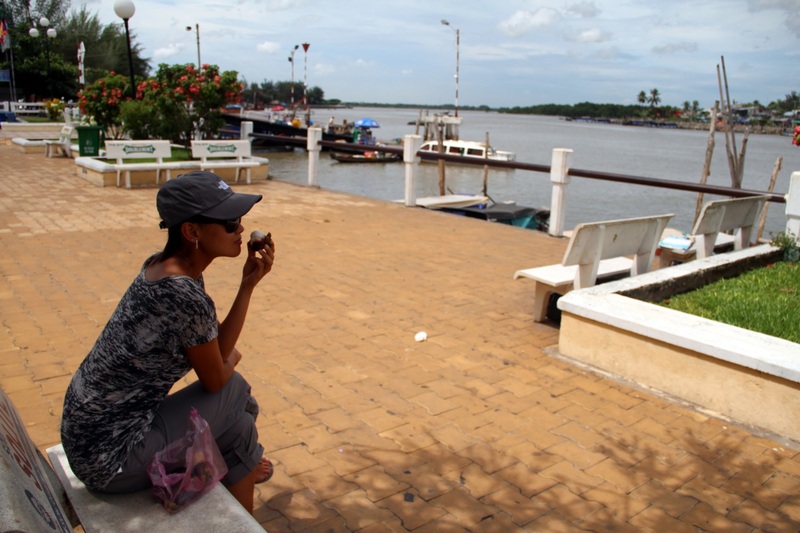 We bought a big bag of mangosteens (Elena’s favorites), and placidly enjoyed their aromatic sweetness by the river. As we walked up and down, we were solicited by several boat operators, mostly old women. We arranged a private tour for the following day for VND 350,000 (~$15), after a short negotiation and pre-paid a deposit. Because the famous floating markets ran early in the morning, there was little to do the rest of the day… let’s get a massage! We failed to find a blind masseuse place we had read about, and ended up walking for two hours in random, uninteresting streets on the other side of the Cai Khe canal. We walked back and stumbled upon a small salon right by hotel, where we got not very professional but still relaxing massage for VDN 120,000 (~$5). As the sun was going down, we made our way back to the market area, where lots of food stands had popped up. 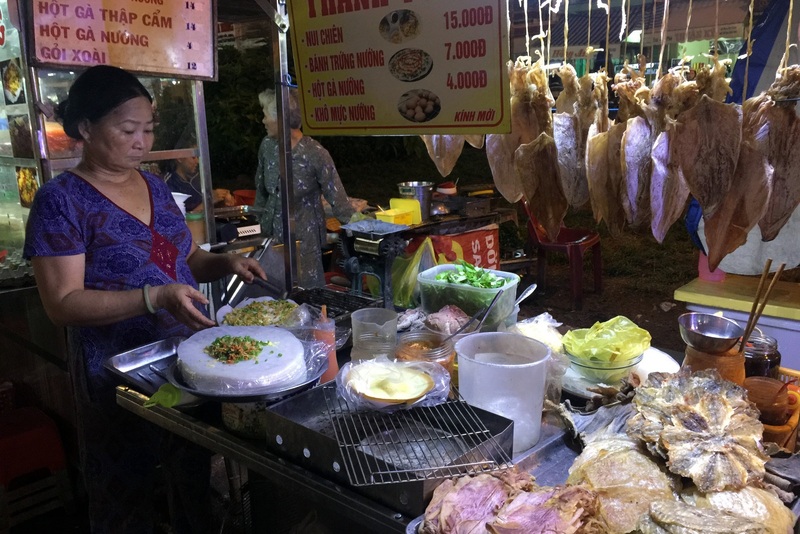 We ate octopus fried balls, shrimp and scallion crepes, sticky rice sweets and more, and drank a few delicious fruit shakes; my favorite was probably the jackfruit one. 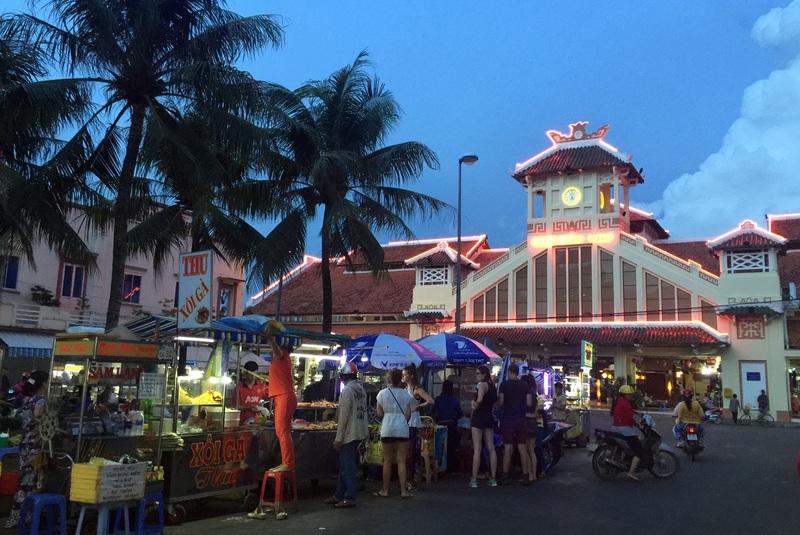 Since we wanted to check out two floating markets, Cai Rang and Phong Dien, and they are most active before 8-9am, we had arranged our boat tour to start at 5:30am, and we needed to go to bed early. Full and tired, we passed out quickly… only to be woken up at 2am by the noise of trucks being unloaded, fish and produce being traded. Lesson learnt: don’t stay close to a market. When we walked to the river, the old lady who had sold us the tour, and who seemed to run a cartel of boats, was waiting for us with our boatman. Soon we were underway, as the sun fought to come out of the horizon and among the clouds. In about half an hour, we arrived at the Cai Rang market area. 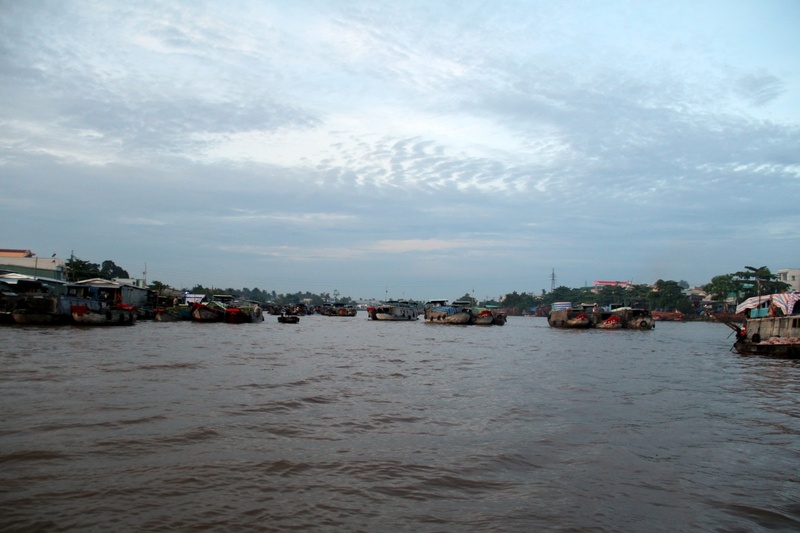 There were tens of large wooden boats, quietly floating in the middle of the brown river. Each one of them had a stick with a fruit or veggie hanging up high, so that buyers could tell from far away what they sold. Smaller boats would approach them to bargain, and once a deal was reached, the produce would be thrown over. It was an interesting sight, but to be honest, it wasn’t as spectacular as I was expecting. Apparently, the level of action depends heavily on the time of the year and the fruit and veggies that are in season. We only saw pineapples, watermelons and some sort of turnip, and overall not as many boats and trades as I had seen in pictures. 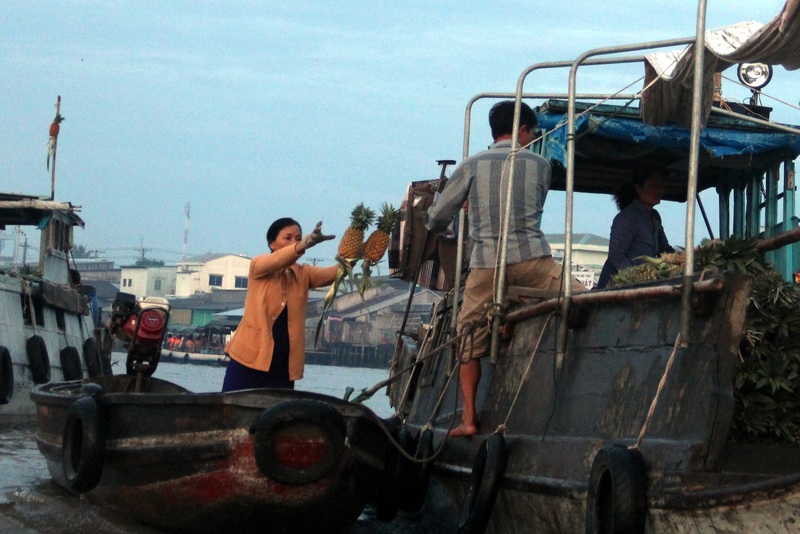 The Phong Dien market, an additional 45 min up river, was underwhelming, with just a couple of boats. 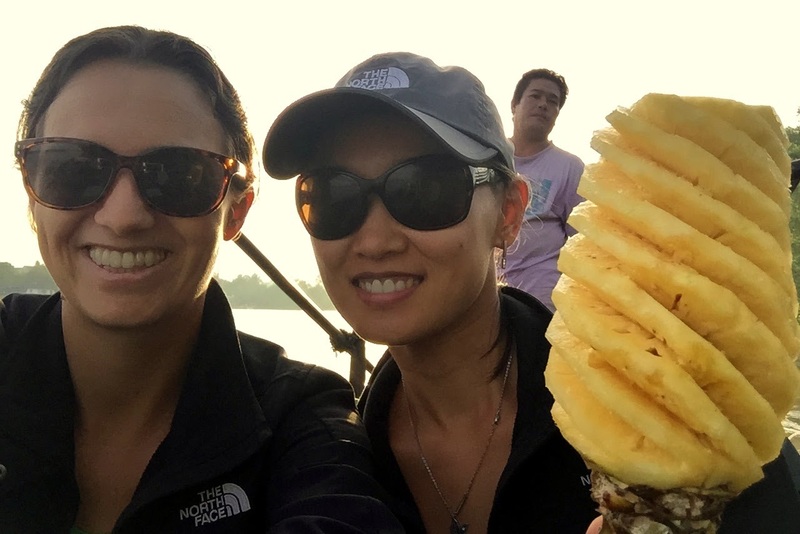 We still enjoyed a breakfast pineapple, cutely carved by our boatman, and the random sights of the river life, like the local ladies stand-up paddling. The tour also included a few more activities beyond the markets, starting with a tour of the canals. 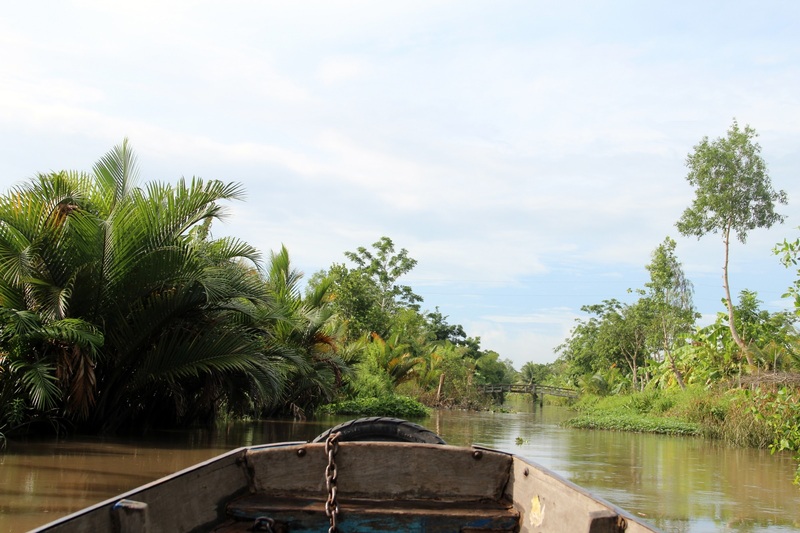 Compared to the development and bustle of the main river, the canals were tranquil and atmospheric, surrounded by lush forest. It reminded me of our time in Maynmar’s Inle Lake, so recent and yet feeling so distant, with so many things happening since. We stopped at a fruit orchard for a walk, though there was nothing much to see. Then we pulled over at a restaurant in the middle of nowhere, but it looked a bit like of a tourist scam, so we decided not to stay. We would eat at the last stop: the noodle factory. 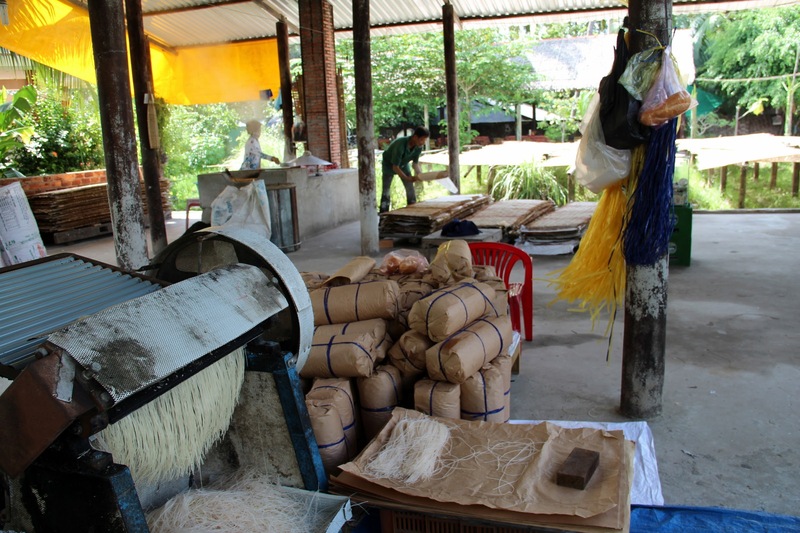 It was cool to see the end-to-end traditional process, from grinding rice to make dough, to creating a sort of tortilla, drying it and cutting it into strings. Elena even got to participate into some of the steps, while I was more interested in sampling what was described to us as noodle pizza… yum! Overall, it was a good 6 hour tour, giving insight into the life in this part of Vietnam. 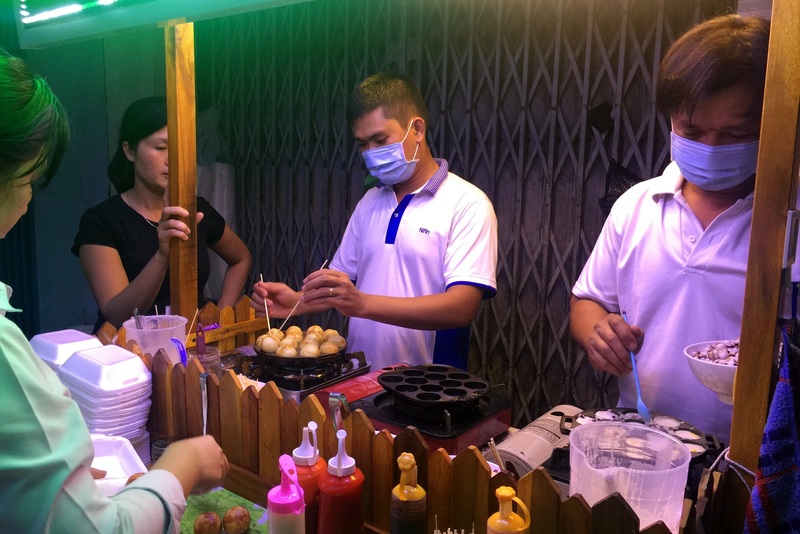 Back in Can Tho, before heading to the bus station and HCMC, we wanted to eat one more time: we absolutely had to have mangosteens again, and we couldn’t leave without trying some stinky yet mouth-watering durian. Hi, Carmen, I’ve enjoyed all your posts! I’m planning a trip to Vietnam. If I only have time for either Ninh Binh or the Mekong delta which should I choose, in your opinion? I may be able to spend another day or two in the one that I choose, or I may do both! Did you find these two areas quite similar? Hard choice… Ninh Binh had my favorite landscapes in all of Vietnam (yes, even better than Halong Bay), but the Mekong Delta was very different from everything else, and had a local life aspect to it that was very cool. The two places are not similar at all, so if you have the time, I would definitely do both. If you’re tight on time, I wouldn’t try to squeeze both, and I would especially not try to “check the box” on the Mekong by doing My Tho… either you make it all the way to Can Tho, or it’s not worth it. Thanks, Carmen, your reply was really helpful.